Parental leave policies are a major policy tool used across OECD countries to support families before and after child birth. There are large differences across countries in the amount and the duration of benefit payments as well as leave entitlement periods. Despite these differences, the shared goal of parental leave policies is to reconcile family life and work, and support child development. While much research attention has been paid to the effects of parental leave policies on maternal labor supply, much less is known about their effects on child development and health. This DIW Roundup summarizes the international literature on parental leave policies and their impact on child outcomes. The literature suggests that the effects are small. However, research in this area is still relatively new and it is too early to draw conclusions about how the design of parental leave policies impacts on child development. Notes: The bars refer to the number of weeks of any paid maternity leave, paid parental leave, and paid home care leave available to mothers. Source: Illustration based on OECD (2016a). Parental leave policies are a major policy tool used across OECD countries used to support families before and after child birth. These policies pursue different objectives, including reconciling family life and work, increasing maternal labor supply, promoting paternal involvement in parenting, or increasing fertility. One common policy objective is to support child health and child development. The design of parental leave policies varies considerably across OECD countries (Figure 1). There are wide variations in the length of paid leave periods, in the amount of parental leave benefits, and in the role of fathers in parental leave entitlements. While countries like the Czech Republic, Finland, Hungary, Norway, and the Slovak Republic offer comparably long paid parental leave spells of more than two years, other countries like Australia, the Netherlands, Spain and Switzerland offer comparably short periods of paid parental leave at less than 6 months. The US does not offer any paid parental leave. The variation in parental leave policies across OECD countries has increased considerably in recent decades, and the debate about whether parental leave should be short or long is growing. While the effects of parental leave policies on maternal labor supply have received considerable research attention, much less is known about their effects on child health and development. In the following, this DIW Roundup summarizes peer-reviewed studies in the field of economics on the impact of parental leave policies on child outcomes, with a particular focus on the differences between the studies; that prevent policy makers from drawing general conclusions about the design of parental leave policies and their impact on child development. Ruhm (2000) and Tanaka (2005) have contributed the first studies on the effects of parental leave mandates on child health. These studies compare differences and changes in parental leave legislations across regions and over time, focusing on outcomes related to child health around child birth, measured at the aggregated country-year-level. The inference on causal effects relies on the assumption that time trends are the same across regions. Ruhm (2000) examines the variations across 16 European countries from 1969 through 1994, while Tanaka (2005) examines variations across 18 OECD countries from 1969 to 2000. They find that longer leave periods reduce the risk of low birth weights, as well as prenatal, infant, and child death. Several studies investigate the impact of parental leave policies on child outcomes by examining the effects of single policy reforms using individual child-level data. The examined policy reforms expanded parental leave entitlements, and were implemented between 1977 and 2002 in different countries. The expansions start from different baseline levels and vary in their intensity (Figure 2). Whether parents are eligible for the previous or the reformed parental leave entitlement is usually based on their child’s birthday. Comparisons of outcomes of children born before and after such birthday eligibility cut-offs provide estimates of the reform effects. Further comparisons are sometimes drawn to children born around the same cut-off in surrounding years in which no reform took place to remove the potential impact of age-at-test effects or season-of-birth effects. The following studies are summarized based on the timing of the expansion, i.e. the age of the child at which longer parental leave periods were granted. This corresponds to the order in which they appear in Figure 2. Rossin (2011) analyzes the effect of introducing 12 weeks of maternity leave around the birth of the child in the US in 1993. He finds small positive effects on child health outcomes. Carneiro, Løken & Salvanes (2015) examine the 1977 reform of parental leave legislation in Norway. While mothers were previously eligible for three months of unpaid leave, the reform entitled mothers to take four months of paid leave, and eight additional months of unpaid leave. In rich administrative data, they find a decline in high school drop-out rates and increases in wages for children born just after the legislative change. In contrast, three other studies examining expansions in paid parental leave entitlements from relatively low levels cannot find effects on children’s schooling outcomes or earning in adult working life. Dustmann & Schönberg (2011) evaluate reforms in Germany that expanded paid parental leave entitlements from two to six months (in 1979) and from six to ten months (in 1986). They find no effect on children’s school track choices and earnings at age 30. 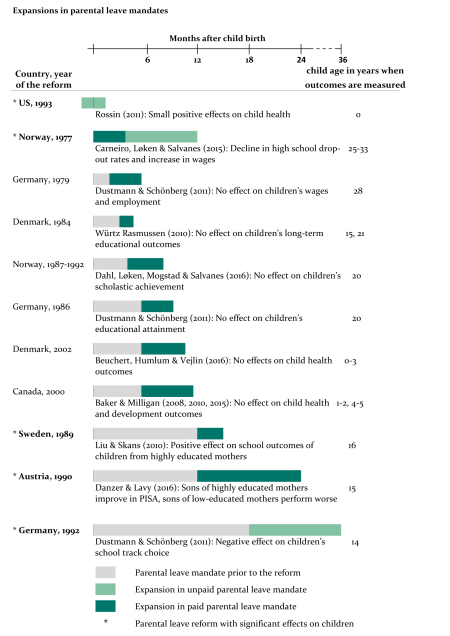 Similarly, Würtz Rasmussen (2010) cannot find an effect on children's long-term educational outcomes from a smaller reform in Denmark in 1984 that expanded paid parental leave from 14 to 20 weeks. Dahl, Løken, Mogstad & Salvanes (2016) examine a series of paid parental leave expansions in Norway between 1987 and 1992 that increased leave entitlements from 18 to 35 weeks. They also cannot find effects on children’s school performance or dropout from high school. Beuchert, Humlum & Vejlin (2016) analyze a 2002 parental leave expansion in Denmark from 24 to 46 weeks on hospital and emergency department visits within the first three years of life of the children. The authors cannot detect effects on these measures of child health. Baker & Milligan (2008, 2010, 2015) evaluate a parental leave reform in Canada that expanded paid parental leave entitlements from 25 to 50 weeks. For this reform, there are no consistent effects on different measures of child health, motor skills and social development. Concluding the studies on expansions within the first year after child birth, only the introduction of paid parental leave in Norway in 1977 positively impacted child outcomes. Where paid parental leave mandates for up to six months were already in place, expansions show no significant effects on children. Two other reforms expanded paid parental leave beyond the first year after child birth and find improvements in schooling outcomes for certain groups of children. Liu & Skans (2010) examine the effect of the 1989 paid parental leave expansion in Sweden from 12 to 15 months. They find a positive effect on school outcomes of children from highly educated mothers. They argue that this effect is driven by a closer mother-child link caused by the parental leave expansion. Danzer & Lavy (2016) examine a large expansion in Austria in 1990 from 12 to 24 months. While sons of highly educated mothers perform better in PISA assessments, sons from low-educated mothers perform worse. The authors suggest that an important explanation may be the quality difference between parental and non-parental child care. The Austrian parental leave expansion increased the time of parents with their newborns in the second year following birth. Here, the authors argue that highly educated mothers might provide a more stimulating child care environment than non-parental child care arrangements. Likewise, the reverse might hold for low-educated mothers. For an expansion of 18 months in unpaid parental leave in Germany in 1992, Dustmann & Schönberg (2011) also find a negative impact on children’s school track choices. This expansion was on top of an existing entitlement of 18 months of paid leave. The data do not contain parental background information, meaning that subgroup heterogeneities could not be examined. As in Danzer & Lavy (2016), it may be that negative effects on children’s school outcomes are driven by low-educated mothers. Expansions in parental leave mandates beyond the first year after childbirth tend to find effects that are likely related to the quality differences between maternal care and alternative care arrangements. Several parental leave regulations across OECD countries reserve a share of the parental leave time for fathers. To our knowledge, only two economics studies examine the effect of paternal leave-taking on child development via variations in paternal leave-taking induced by a legislative change. Ekberg, Eriksson & Friebel (2013) find no evidence that a 1995 parental leave reform introducing a daddy month in Sweden affected fathers’ care for children when they are sick. Cools, Fiva & Kirkebøen (2015) evaluate two reforms in Norway in 1992 and 1993 to isolate the effect of four weeks of parental leave reserved for fathers. They find a substantial increase in children’s performance in school. They argue that four weeks of paternity leave can have a significant and lasting effect on children as it may not just alter the long-term paternal involvement in both parenting and domestic work, but it may also increase children’s attachment to the father. These initial gains were reinforced over time and could have large effects on school attainments. Overall, the empirical findings on the effects of parental leave policies on child development are mixed. Why do some studies find that reforms impact child outcomes and others do not? The existing studies differ in several dimensions, which may explain the differences in their findings. The differences described in the following are based on an overview of previous research by Danzer & Lavy (2016). Timing of the expansion: The evaluated reforms expand parental leave entitlements from different levels of previous eligibility (Figure 2). Of the six evaluated expansions within the first year after child birth, only the 1977 reform in Norway which introduced paid parental leave, finds effects on long-term child outcomes (Carneiro, Løken & Salvanes, 2015). This may indicate that more parental time in the very early months after child birth are particularly important for child development. However, expansions of parental leave beyond the first year also show effects, but only in certain groups of children (and parents). Possible reasons are the counterfactual mode of care or different care needs of children in different phases of their development. Alternative mode of care: The evaluated parental leave reforms were implemented in different countries between 1977 and 2002. This also implies differences across studies in maternal labor market attachment, in non-parental child care availability, and in the quality of non-parental child care. One would have to ask what the alternative mode of care would have been if parental leave expansions had not been implemented. At the time of the parental leave reforms, Scandinavian countries had a comparably high availability of day care for very young children, while countries like Germany and Austria had rather low rates (OECD, 2016b). Intensity of the expansion: The intensity of the paid parental leave expansion also differs between studies (Figure 2). For example, while Denmark expanded paid parental leave by 6 weeks in 1984, Austria expanded it by 12 months in 1990, and Germany extended the job protection period (unpaid parental leave) by 18 months in 1992. The intensity of the expansion may be an important factor underlying the observed effects on child development, as they are more likely to induce behavioral responses of parents. Small expansions may be less likely to have an impact on children than large expansions. The two studies by Dustmann & Schönberg (2011) and Danzer & Lavy (2016) on the comparably large expansion in Germany and Austria indeed find effects on child development. Paid or unpaid parental leave: The evaluated reforms also differ in terms of the amount of parental leave benefits. Some studies evaluate the effect of unpaid parental leave expansions, other studies look at the effects of paid parental leave. Even within paid parental leave expansions, the amount of benefits differs considerably across reforms. While the 1977 reform in Norway introduced benefits fully compensating maternal pre-birth earnings, the 1979 reform in Germany paid a lump-sum corresponding to about one third of average pre-birth earnings. This income effect of the reform may directly impact child development, but it also sets varying incentives for maternal labor supply, which can also impact child development. These four dimensions may already provide explanations for differences in effects on child development between studies. Furthermore, their interactions may play a role. While the introduction of four months of paid parental leave in Norway had measurable effects (Carneiro, Løken & Salvanes, 2015), a stronger expansion of six months in Canada had no measureable effects; however, it expanded paid parental leave from a baseline level of six months (Baker & Milligan, 2008, 2010, 2015). Age when child outcomes are measured: Most studies focus on child outcomes when children are aged 14 or older. While these studies are informative on the long-term impact on children, it is not clear whether the policies had an initial impact on child development that faded out over time. Only four studies on two reforms consider child outcomes before school entry, of which only one study identifies robust effects. Children’s outcome measures: While the majority of papers analyze the effect on educational attainment, some also examine labor market outcomes of children. The impact on measures of child health and behavior is only examined in two quasi-experimental settings (Baker & Milligan, 2008, 2010, 2015, Rossin, 2011). It may well be that different reforms affect different margins of child development that are not yet captured in the literature. Effect heterogeneities: One focus in the existing literature is on estimating the average reform effect on child development. The study by Danzer & Lavy (2016) estimates reform effects in subgroups and reveals effect heterogeneities by gender in subgroups of different maternal education levels. Such heterogeneities in reform effects are not considered much in other studies. Therefore, zero average treatment effects may hide differential reform effect heterogeneities that have received little attention in the literature. Overall, the studies differ in too many dimensions to draw reasonable conclusions about the relationship between the design of parental leave policies and child development. Parental leave policies are an important family policy tool across OECD countries. While their objectives are manifold, these policies all seek to support families and to improve child development. A small literature examines the effects of parental leave policies on child development with mixed findings. Some studies demonstrate that parental leave policies can indeed impact child development. However, most research finds small or no effects. Research in this area is still its infancy and it is too early to draw conclusions on how the design of parental leave policies impacts on child development. More research is needed to learn about the relevant factors. Danzer, N., & Lavy, V. (2016). Parental Leave and Children’s Schooling Outcomes: Quasi-Experimental Evidence from a Large Parental Leave Reform. The Economic Journal, forthcoming. Liu, Q., & Skans, O. N. (2010). The Duration of Paid Parental Leave and Children’s Scholastic Performance. B . E . Journal of Economic Analysis & Policy Contributions, 10(1). http://www.degruyter.com/view/j/bejeap.